Peru is a wonderful destination for families. The people are welcoming, the landscape diverse, the culture and history rich – even the cuisine is one of the hottest new food trends (guinea pig optional!). 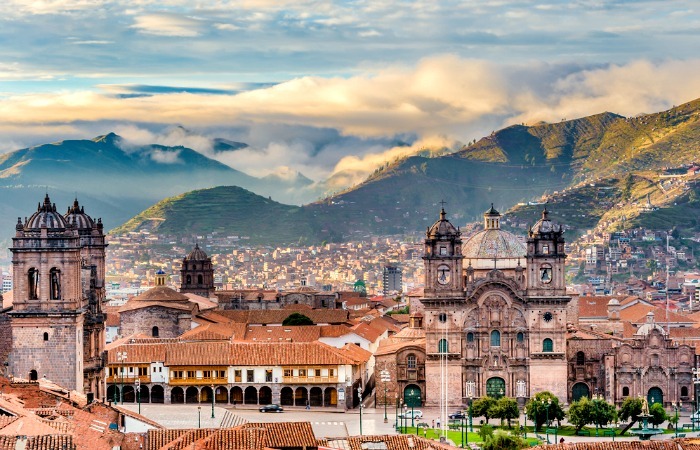 From the Amazon jungle to the Andes mountains and from colourful markets to mystical Incan ruins, this country has something to appeal to everyone. 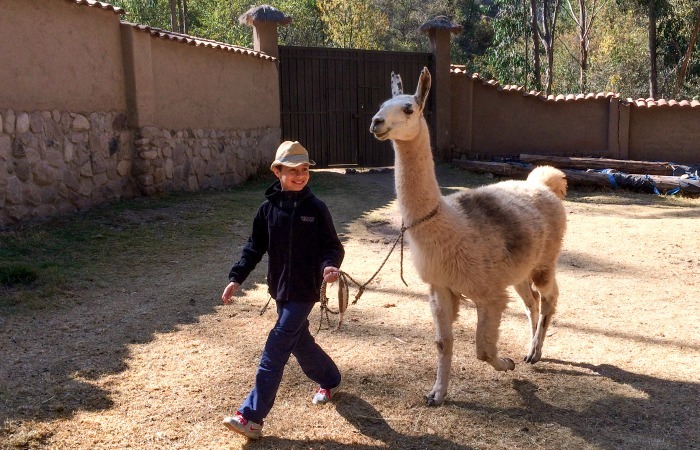 Here’s our top ten things to do in Peru with kids. Trust us, we had difficulties curtailing the list to just ten! Nothing gives you more insight into indigenous culture and life than staying with a local family. Unfortunately, given how understandably popular homestays are, many of them have become victims of their own success and are rather crowded. One of the best-known homestays on Lake Titicaca, for example, is on Amantani Island. Fascinating, yes, but you’ll be sharing it with between 150 – 200 people at the same time. If you want a much more authentic – and crowd free – experience, there’s a little place we know on the shores of the lake which is much, much quieter and you’re more likely than not to have the village pretty much to yourself. Walk along the lake-shore, hike to a beautiful lookout point, visit an ancestral ceremonial centre, learn about farming and weaving techniques and enjoy delicious, home-cooked food. A deserving top ten thing to do with the family. You can take a llama to pasture (but you can’t make it drink), or so they say. A highly unusual activity, but one which younger children love, we can arrange for your family to join a local herdsman who will take you on a gentle walk accompanied by llamas, stopping for a picnic, before he heads up to grazing pastures with his small flock. Pisac is a regular on any family trip to Peru with the kids, famous for its colourful market and hilltop ruins. But what the vast majority of the tourists don’t realise is that the most impressive section of the ruins is a 25 minute hike down the hill, through an ancient Incan doorway and on a little ridge. After walking through the ruins, often with barely another soul around, you can carry on downhill past irrigation channels and small temple complexes, finally arriving in the town of Pisac at the bottom. This is one of our favourite short hikes in the Sacred Valley, a primarily downhill route that is peppered with ruins along the way and with breath-taking views over the surrounding landscape. The path is relatively precipitous in places so you need to take care with younger children, but it is a wonderful way to spend a morning and you can meet your vehicle in the village at the bottom to save you from having to walk back up again! In order to keep the children’s interest piqued it is important that any holiday in Peru with kids doesn’t become an endless traipse around the ruins. Yes they are magnificent, but most children (and quite a few adults, dare we say it) need a bit of variety. Spice of life and all that. Over the past few years, Peru, or more accurately, The Sacred Valley, has gained a reputation as an adventure travel hotspot, a magnet for those who like an adrenaline injection now and again. Ziplining (seven wires over dramatic scenery), white water rafting, cycling and more. Located along a 60 kilometre stretch of fertile farmland and Spanish colonial villages between Pisac and Ollantaytambo, the slopes are a perfect playground whilst parts of the Urubamba river can get up to grade 4 rapids, particularly following rainfall. This is the perfect venue for a spot of adventure and a welcome complement to the more traditional sightseeing. Penguins, sea-lions, Inca terns, pelicans and dolphins are just some of the thrilling wildlife that inhabits the Ballestas Islands, a group of islands just off Paracas. Cruising by boat affords the best wildlife views and you’ll also take in the huge candelabra geoglyph etched into the giant sand dune on the coast. If you don’t have time on your side, then we can arrange a day trip boat excursion to the Islas Palomino, seeing sea lions in their natural habitat and even getting in the water with them. When we say, tarantula spotting, we really mean tarantula, toucan, parrot, giant river otter, caiman and parakeet spotting, such is the rich biodiversity of the Amazon. An undoubted highlight of any trip to Peru with the kids is the chance to head deep into the jungle and spend a couple of nights in an Amazonian eco lodge. From your base on the banks of the Tambopata River you can explore by boat, catamaran or foot. You can fish for piranhas in the river, climb a canopy tower for immense views over the jungle below, visit a botanical farm to learn about forest medicines, and both go to sleep and wake up to a cacophony of the weird, wild and wonderful sounds of the forest. Bliss. Our lodge of choice is the Corto Maltes Lodge. Not only are the guides here particularly good with children (Jose a firm family favourite) but also there is a pool which is a huge bonus with children. It may not be as deep in the jungle as other lodges, but a 30 minute journey by boat is about right for most families. No visit to Peru would be complete without a visit to its best known, most iconic sight, the ancient Inca city of Machu Picchu. It’s THE top thing to do in Peru with kids. It doesn’t matter how many times you’ve seen it on TV, or in a magazine, watching the sun peep over the top of the mountains to flood the ruins with sunlight literally takes your breath away. Our top tip is to get the first bus up to the ruins at 05.30. Yes this means an early start, but it also means that you can wander through the deserted ruins at sun-rise and explore before the hordes arrive. Families with older children might also want to consider climbing Machu Picchu Mountain which towers above the ruins. This is not to be confused with Huayna Picchu, a much more popular climb. No, it is much higher and much, much less visited. Last time we climbed we were the second group to have signed in for the climb that day and we only passed one more person when we were descending back down again. It’s an arduous climb but from the top the views over the site and the surrounding mountains are absolutely incredible. Highly recommended. If your kids are experiencing ‘ruin fatigue’, then this, slightly morbid experience will fascinate. 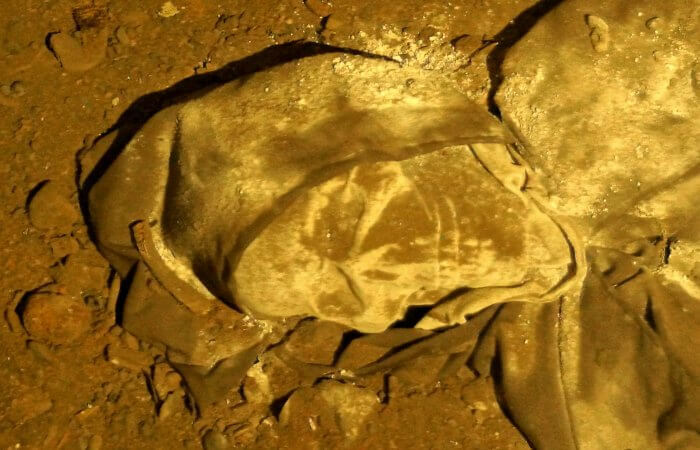 In 1995, an expedition discovered the still-frozen body of an Inca girl, disturbed from her ceremonial burial site by a recent volcanic eruption. Nicknamed “Juanita”, this 500-year-old frozen girl is still on display at El Museo Santuarios Andinos in Arequipa. The video and tour that lead up to seeing Juanita are highly recommended (check out the Lonely Planet review here). Arequipa also has some fabulous family-friendly accommodation so go and relax in your hammock by the pool afterwards, savouring the last few days of your tour… If your route doesn’t take you to Arequipa, then the catacombs under the cathedral in Lima will tick the box – there are real bones still down there – fascinating. The catacombs beneath Lima Cathedral are fascinating, if a little ghoulish! 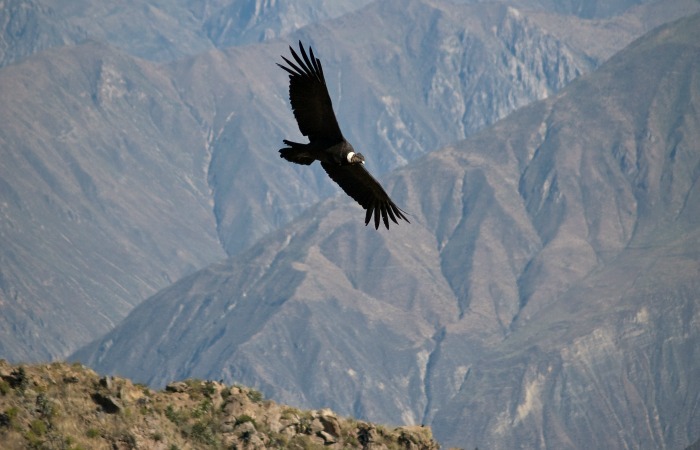 Situated in the deepest gorge in the world, any nature-loving child will be captivated by condors, the largest land birds on the planet, as they soar on the thermals, which rise from the valley floor. The views over the canyon are staggering as well, with the ground dropping away beneath you. For a genuine “slice of life” here, we highly recommend a visit to Coporaque for an immersive village experience. You’ll be out in the fields surrounded by new friends before you know it; we can even arrange for you to stay in a homestay here if you like. Pamper yourself afterwards with a visit to the open-air hot springs for a good soak – bliss! Haggling with the traders at Cusco market (Mercado Central de San Pedro) isn’t just a way to get to meet the locals but is huge fun. It’s no usual market either. Instead, a vast warehouse type space that houses hundreds of stalls and vendors. If it’s made in Peru, you’ll find it here. There’s also a huge food court from which you can sample just about every Peruvian dish you can think of (guinea pig, ceviche, chicken soup) and many more you can’t. If energy levels flag, pep yourselves up with a sugary pot of churros and chocolate sauce…. Yum! Why not give the children a bit of pocket money each and see who can get the best deal on a souvenir. Watch the competitive spirit develop as each of the children vie for the best deal! Check out our sample Peru itineraries to see how to combine these activities into the perfect holiday to Peru with kids. For more of a country overview, see our Peru family holiday section. 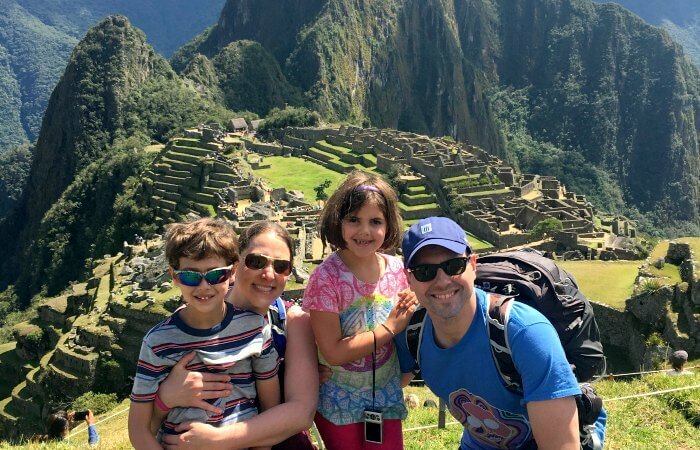 You can check out the weather here and also find out what other families say about their trip on our Peru customer review page. Call or email if you’d like to chat with one of our team. If you’ve already been, we’d love to hear about your experiences of travelling to Peru with kids so do email us at info@stubbornmuletravel.com.